As mentioned yesterday, in a bid to do something, anything other than tackle the black of the Ravenwing I jumped ship to the Genestealer Hybrids and paintign their environment suits grey. 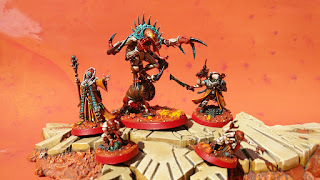 The Acolytes were up first, I'm not sure how many I did that first night but it was such an onerous task I was actually regretting this course of action and wondering if those Ravenwing weren't so bad afterall!? 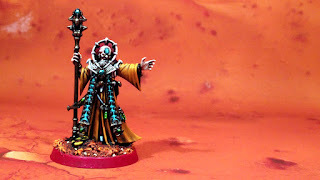 The Neophytes were actually much worse to paint, it was dull and tedious and I think I spread it out over three nights just because I foudn it so unrewarding. As a kickstart to getting back on the Ravenwing it sort of worked but I couldn't leave them half-done so pushed on. However, the end result is already changing the look and feel of the Hybrids. There's still a lot to do on them but this was a big change to their overall colour balance and chipping away at them like this will once again pay dividends when I tackle them as a priority. 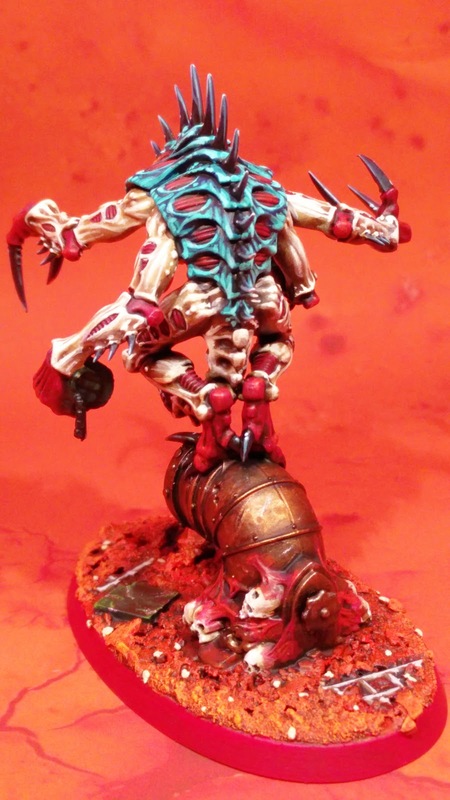 Some of the Neophytes need some more base colours on details, there may be some bonewhite to start on the nid arms. Then it's weathering the metals and all the washes which I'm quite looking forward to, despite there being even more to do after that! Still, it did the trick - I moved them on and I felt the urge to return to the Ravenwing, but can I capitalise on that urge? 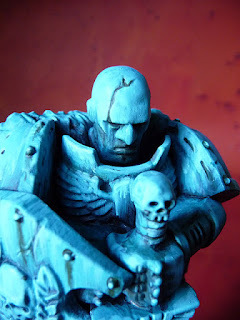 Anyway it's not that picture I'm sharing with you for the GW cameo, but something else. Recently I was swayed by a good review of a BBC3 comedy called This Country. Now I'm a big fan of comedies, I strongly believe that life can be miserable enough and spending some time watching programmes made to make you laugh is time well spent [if they're funny of course]. The fact the two main characters wrote, star and even managed to get it made deserves a bit of support. This Country is a bit of a slow paced comedy, similar in vein to The Detectorists. In fact on first viewing I imagine they inhabit the same locale. It's a 'mockumentary exploring the lives of young people in modern rural Britain.' I'm sure it'd be a wonderful eye-opener about a certain aspect of youth in this country for my international readers, but imagine you can't access it outside the UK. Sorry, that's because of the unique way the BBC is funded. Anyway, episode 4, entitled 'King of the Nerds' features more than just a passing cameo of Warhammer, although it's not the best episode in the series so far but it's still amusing. It's not quite as cringeworthy as The Office [by which all mockumentaries are judged] but I guarantee most hobbyists will giggle, then rage a little about some random made-up rules and then immediately chide themselves with the subsequent scenes - I did. The jokes aren't completely at our expense so don't worry ;) It is worth noting that that's a Chaos Dreadhold - Overlord Bastion in the shot so I'm wondering if that was bought for the show as everything else looks 'older'. The problem with these posts is they’re very much a snapshot of what I’m feeling at the time and if I already have a schedule of posts, which unusually I do at the moment then how I’m feeling right now may very well have come and gone/resolved itself by the time this is posted. Nevermind, I will continue regardless because it’s like a tattoo, it’s relevant at the time… or at least seems to be. So where is my head @? It’s all over the place actually. You probably noticed a few weeks back there was limited service on the blog, this was really due to a lack of content. 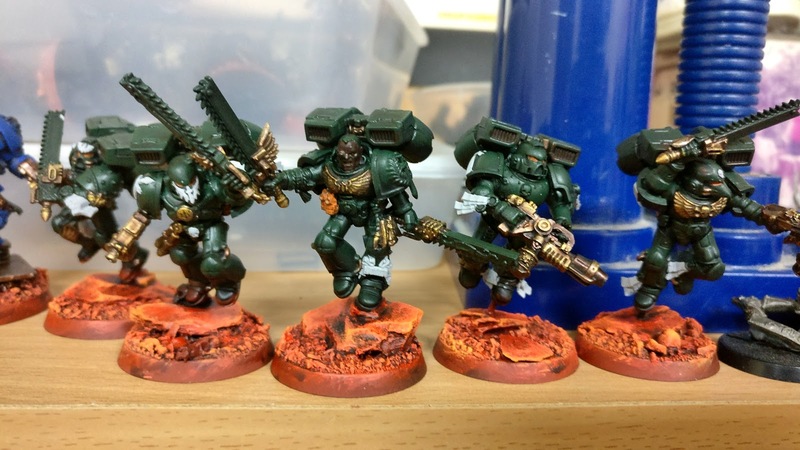 The Ravenwing were priority and photographs did not really show the efforts and progress achieved. So there was a lot of satisfaction – I’d settled on something, I felt good about it, I’d overcome hurdles [all the metallics] and now it was the black to highlight which I thought I was cool with... and immediately refused at that hurdle. 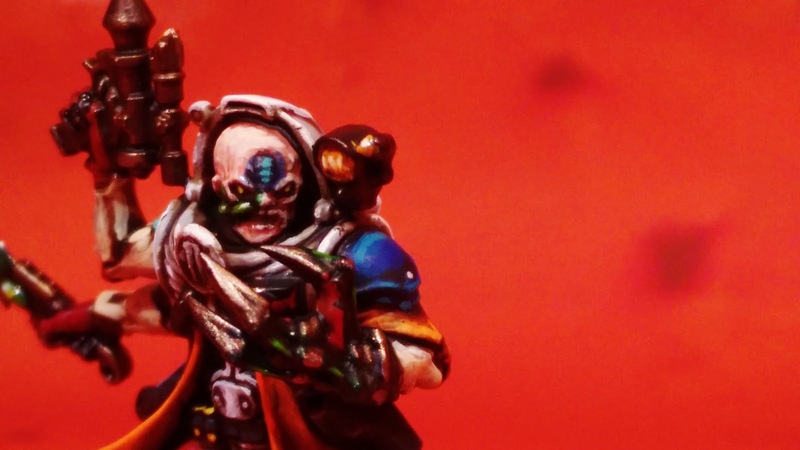 So I looked back at my previous Ravenwing post to reassure me of the process, and inadvertently hit on the same action of focussing on one miniature – the Apothecary. And progress was physically continuous, it just wasn’t mentally. I felt I'd hit upon the approach to overcome the hurdle but I couldn't quite crack it. As much as I wanted to tackle these bikers and get them done they just wouldn't play ball with me. I would add some details here and there but really it was just avoiding the black. I took the Company Champion through both sets of highlights and was ultimately disenchanted despite it remaining true to my previous Ravenwing efforts. 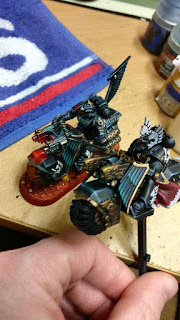 I highlighted another bike so I have one completely highlighted with the black and one or two on first highlights, leaving 10 still to do and that’s where the brakes came on as I realised the enormity of the task remaining. 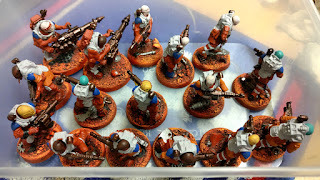 I immediately looked round for an alternative and did a little update on my Assault squad – Stonewall Grey again. I looked mournfully at my Land Speeder Dark Shroud – can’t get past building the Icon of Caliban/magnetising hurdle. I’d solved a problem with Project Z that may one day mean it actually moves into reality but there’s still much to do before I feel confident enough to reveal it. 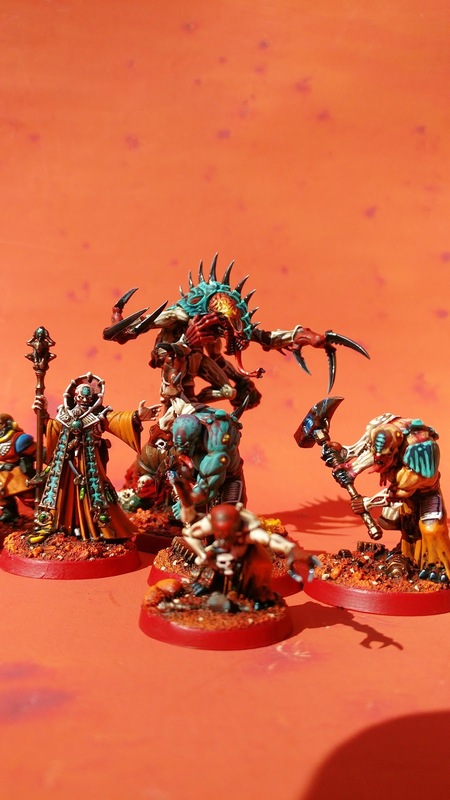 And ultimately it led me back to my Genestealer Hybrids, just Stonewall Grey on their environment suits but it’s stuff that needs to be done and when better to do it than when my heads all over the shop. 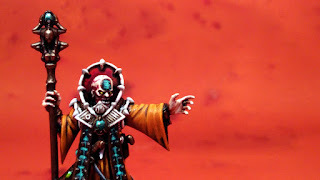 The thing is I can see ahead to the end of the Hobby Season and I think I’m confident of what I could achieve in that time but that requires my mind to engage and for me to focus on those tasks and I know that’s just not realistic. The downside to staying up late to paint is that leaves you with a lack of sleep. I’ve managed to get by on 5-6 hours a night for a good few years now I’m used to it but eventually it does catch up on me. I’ve tried going to bed earlier, it doesn’t make me feel any better and I know for it really to pay dividends it has to be consistent, which means I’ll have to sacrifice the late nights altogether. It also means should I choose to stay up I’ll really feel it when in fact nowadays it’s that one early night that feels worse than the six lates in a week. With these thoughts discarded into my internet penseive I hope I can move forwards. It’s reminded me of mushin ‘the mind without mind’ from when I was doing kendo. There are definite moments where I need to stop thinking and just do. Looking at that Wikipedia page I have to say this quote from a ‘legendary Zen master’ is not a million miles from what I’ve been saying from day one on the blog, who knew I’d mastered Zen along the way? The mind must always be in the state of 'flowing,' for when it stops anywhere that means the flow is interrupted and it is this interruption that is injurious to the well-being of the mind. And it also reminds me a bit about The Game, which you just lost. Fingers crossed by the time this post finds itself published* my headspace is once again free, uncluttered and in full flow. But no need to worry about anything I'm just getting my head straight is all, that's what the blog is for. What does 8 mean to me? It means we get new rules, that's about it. The fact they're FREE initially, means I haven't got anything to complain about, and I play 'nids I know how to complain! 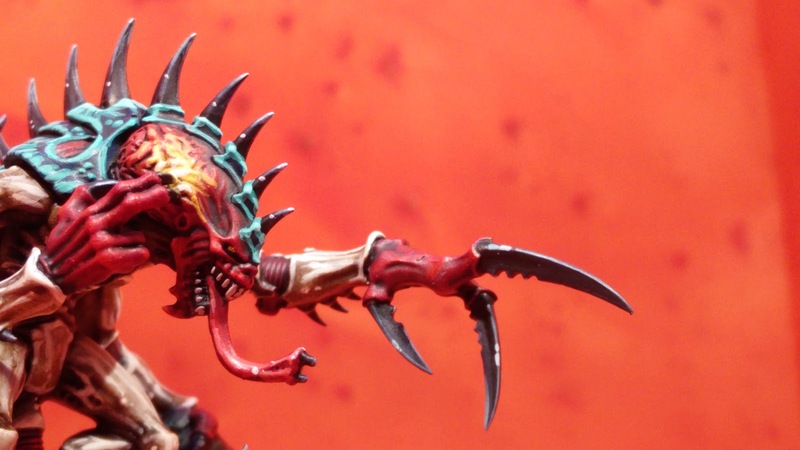 There's no way I'm rage-quitting, for all I know nids might actually get some cool new rules. 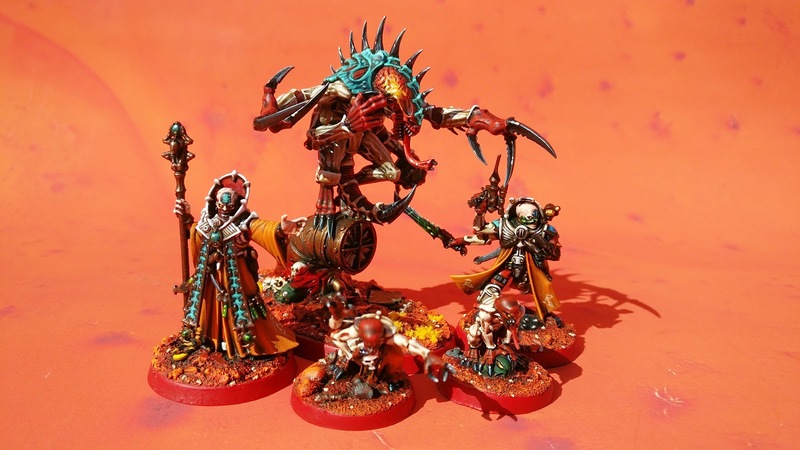 And we're all in the same boat, so unlike when your swanky new Codex hits - you get excited and then realise it's not workable and you're back of the queue again. 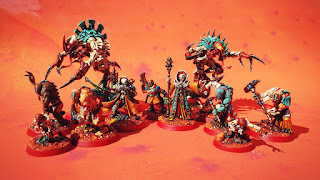 Well this time time we're all starting from the same point with a new way[s] to play and rules and not just the variations of the rules I've played since returning in 5th edition. On top of that we'll all have new rules for our Factions and with a push to end all those stupid imbalances and over-powered broken upgrades, we may well have viable competitive options for all. I certainly would love the idea to not look across the table at an opponents army and go Eldar - bleurgh, Necron Decurion - bleurgh, Tau - bleurgh! etc. If 8th is the great leveller then I'm all for it. I'm sure folk will find a way to break it, they always do. Even when it's a friendly fluffy list tournament someone will always bring a cheese list. At my son's primary school every year on Sport's Day the year 6 boys always do something funny and unique in the final sprint race crossing the line altogether. Over the years though there have been a few instances where one kid will just break ranks and insist on 'winning the race'. That's what I see with those cheese lists at a friendly event - an 11 year old trying to win at the expense of everyone else. If 8th edition brings back the spirit of the hobby, even if nids are still pants, then I'll be a happy bunny. I will miss templates though. Alex said they're always contentious in tournaments, which might be true and the replacement rules may well be easier, quicker and more representative but I will miss them as artifacts. 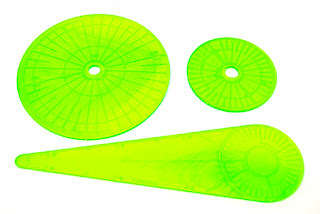 They made neon green acrylic cool, when Necrons couldn't. 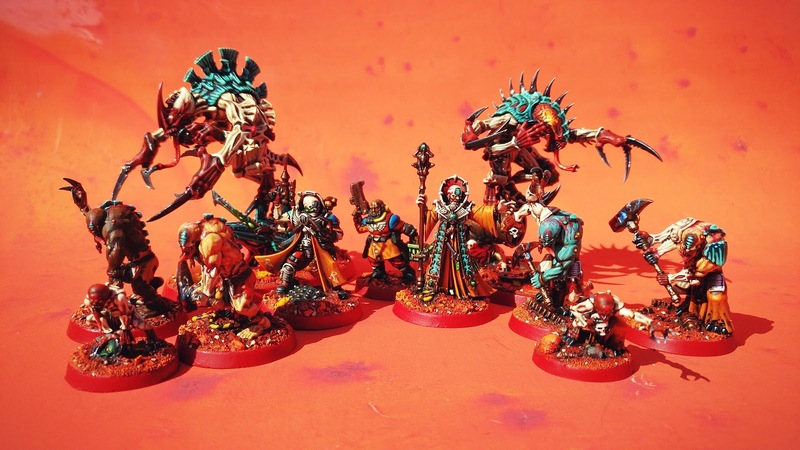 However, I had actually been using [losing] the softer plastic translucent ones from Battle for Macragge because they had that hole in the edge you could link them altogether so you wouldn't lose one [just all of them at once ;) ]. I'd also been lusting after the Shadow War red ones but now there's no point in them I can dismiss them altogether. So that's me, bring on 8th I can't wait to see what we've got in store for the hobby. I've a post on Wednesday of where my head is @, and I recognise it may well feel very different because it was written when these pictures were taken on the 10th April. 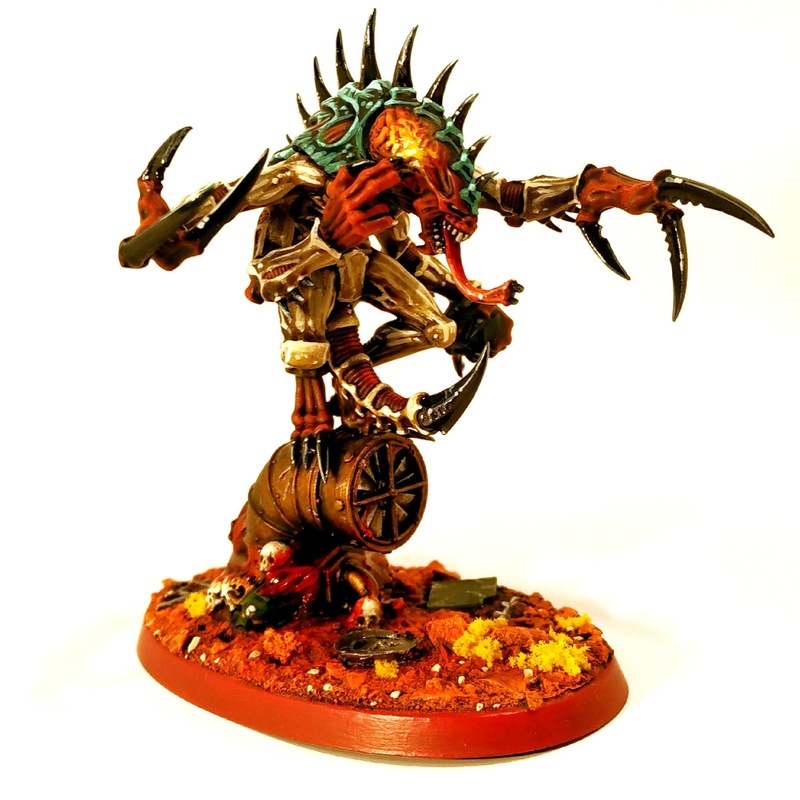 Its only now I can fit the posts into my schedule but the situation currently is that as much as I want to box off the Ravenwing the black is defeating me. It's not so much I can't do it, the pictures below are evidence I can, it's just that the thought of doing it fills me with a state of inertia. I tried to resolve this by tackling the bikers that have the least amount of black, for some reason choosing the Company Champion and not the Apothecary [who was already more advance] as my primary objective. 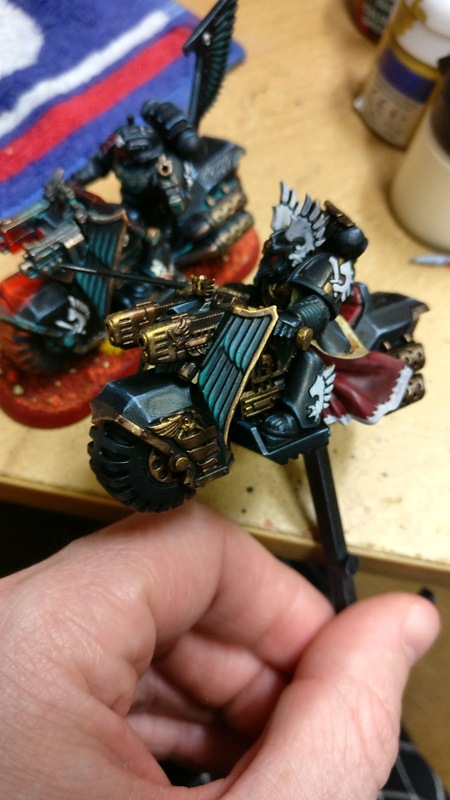 As is clear in the picture I've managed to match the black with my previous Ravenwing bikes but for some reason I was left disappointed, fearing I'd gone too light with the highlights. I need to remind myself not to judge a model until it's complete, or at least until I deem it complete. I tried to carry on regardless but put my efforts into the Stonewall grey on all the bikes - picking out the company markings and purity seals. I also Strong Tone washed them all and did their cloaks hoping I'd feel reinvigorated to tackle some, if not all of the remaining bikes. So far it's not the case. Two have started highlighting eleven left to do. 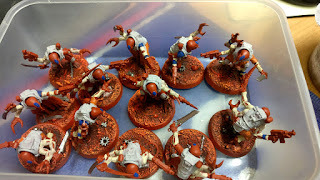 'nids part 213 - Genestealer cult - Aberrants - TO DONE! 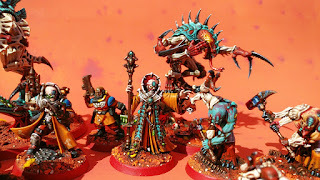 Last of my Genestealer Cult successes so far. As you can see some pretty harsh shadows from the sun on these, that's why two lights help even them out. Still they're not too bad in showcasing what I painted. Not 100% sure why these snuck into my painting schedule. Obviously there had been a diversion from the Drop Pods when I was finding them a 'challenge'. I think perhaps because they were only a batch of 4 and with less detail than the Brood Coven they got a head start as something I could just crack on with to feel like I was gettign somewhere. 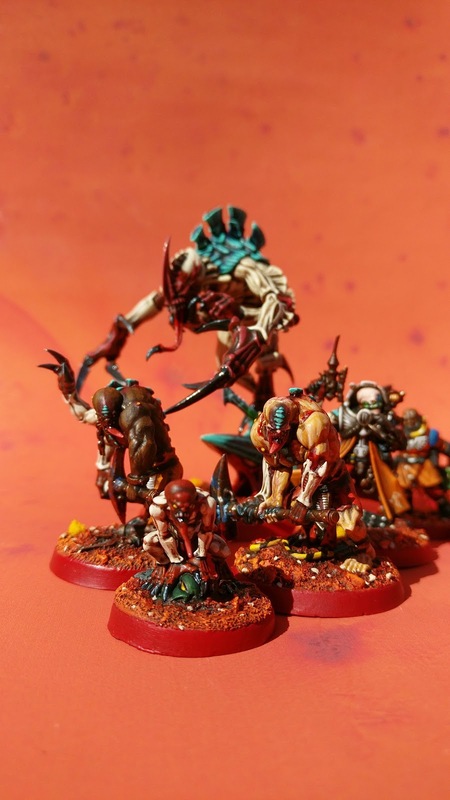 Reconciling my ethnically diverse residents of Ferron Proxima with my Hive Fleet Gorgon was always going to be a challenge. 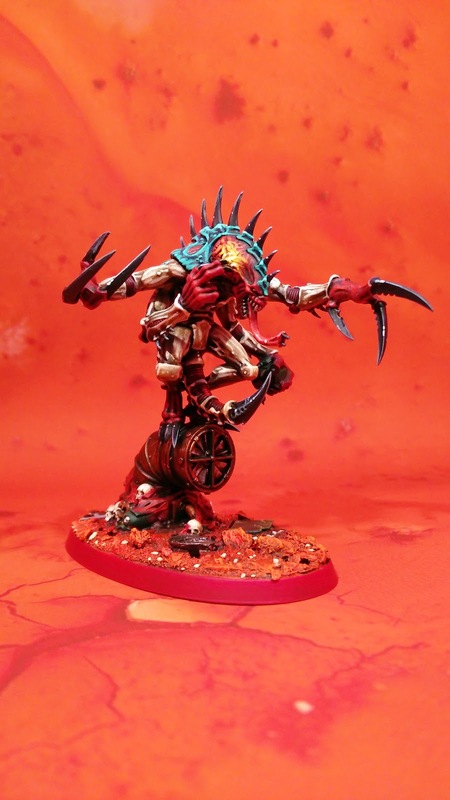 Moreso because of the way they suggest as the hybrids get newer the Genestealer appearance becomes less... 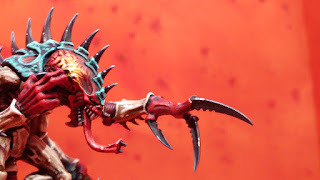 Forget that I just did some bits flesh and the other bits nids. 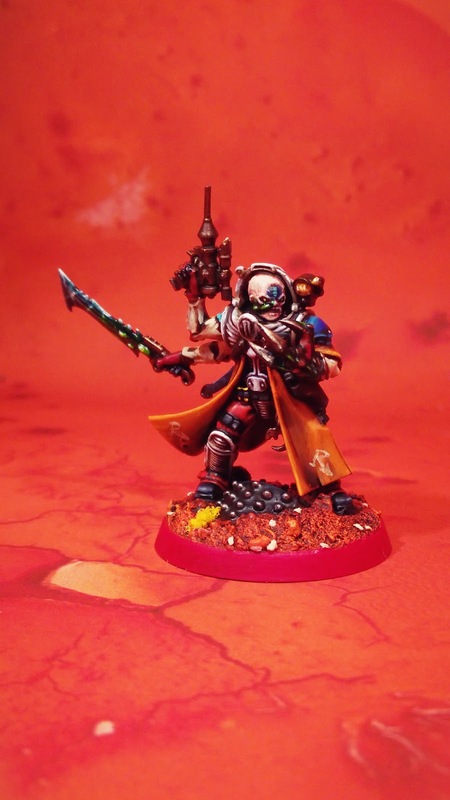 Still think I could have added a Free Radical Collective logo on his tabard. 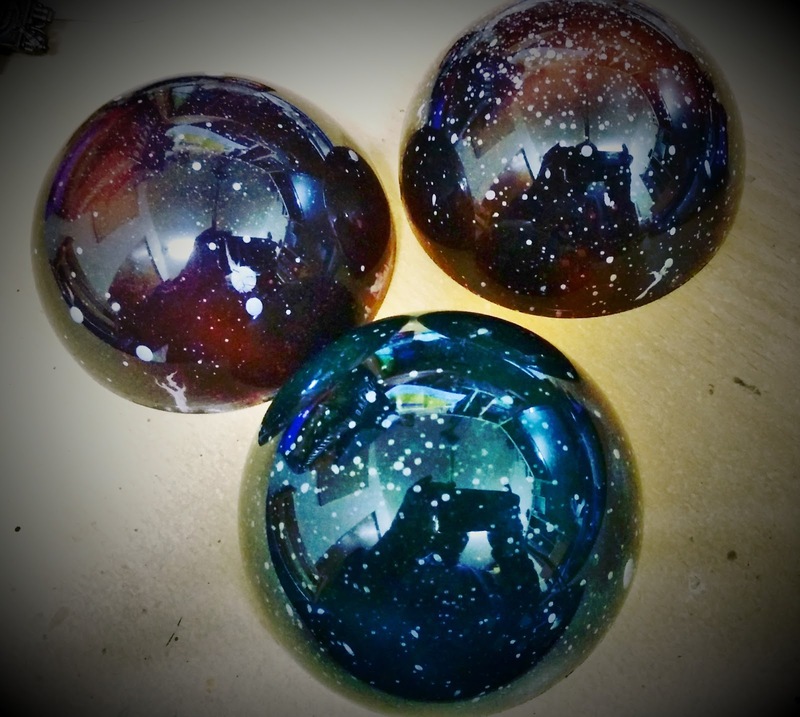 The blue Aberrant was the gamble. 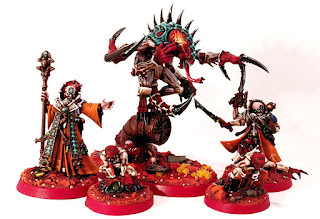 I had tried a few when I converted my Dark Vengeance Cultists but I realised this would be a much harder sell. 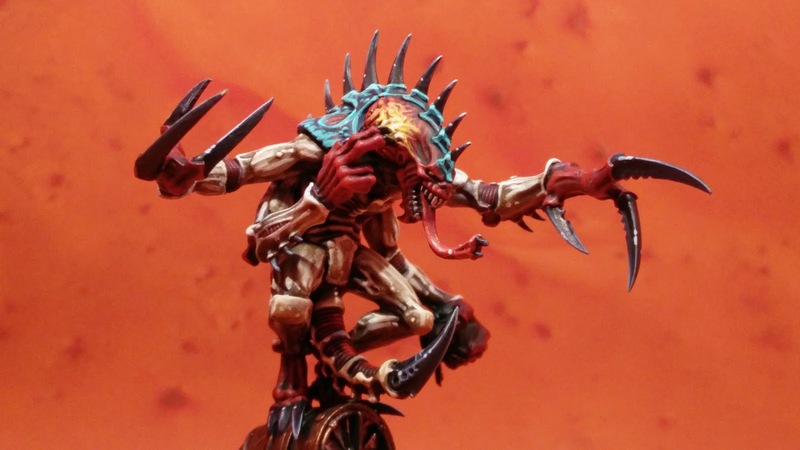 I still wanted that Rogue Trooper feel but this is mixed up DNA where the standard colouration of the Chitin armour has somehow got mixed in with the melanin of the skin. 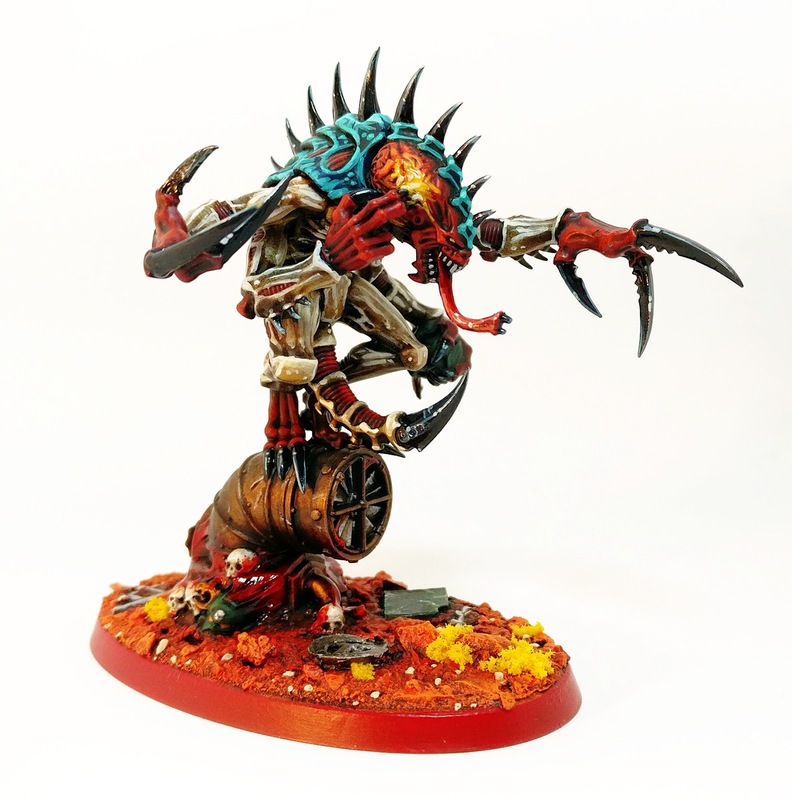 The science is clearly sound, but I htink it worked in the end and even the chitin spine ridges manage to be sufficiently different fromt he skin to stand out. The red/pruple shading in the recesses helped with this. And some of it is much more than I hoped for but I think there's still alot more I can improve. 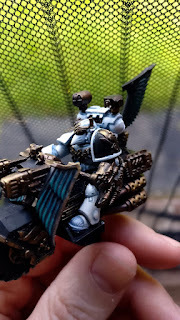 Duncan advises using the Violet wash to make richer shading on dark skinned people [or things] I might need to try it but investing in a wash I'm only going to use once in a while feels like overkill [Deathwatch Overkill?]. 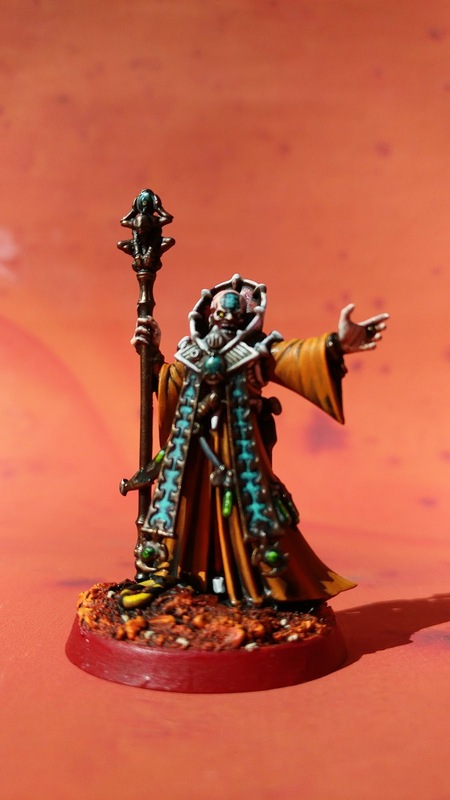 The 'Caucassian' Abberrants actually use my Vallejo Bronzed flesh colour so aren't as pale skinned as both my Magus and Primus. Should I do the other four Aberrants that gives me scope for even more variety but I'm still not sure on what I'll do. Here we go with the new light box setup. It was a bit of a snap shot, which is why it's a little blurred in places or the focus isn;t quite right. The colours are OK, perhaps a little too much contrast, even for my liking. The one disappointment with these was the power weapons, the glows in the coils were OK, it's the 'lightning' effecton the hammers and picks that just didn't work, hence why I tried to cover most of them with Tamiya Clear Red X-27 blood spatter. Overall though I can live with it because they're done, I got to do things differently, they don't look bad and best of all they're complete which is why I get the Big Purple Stamp of Approval! 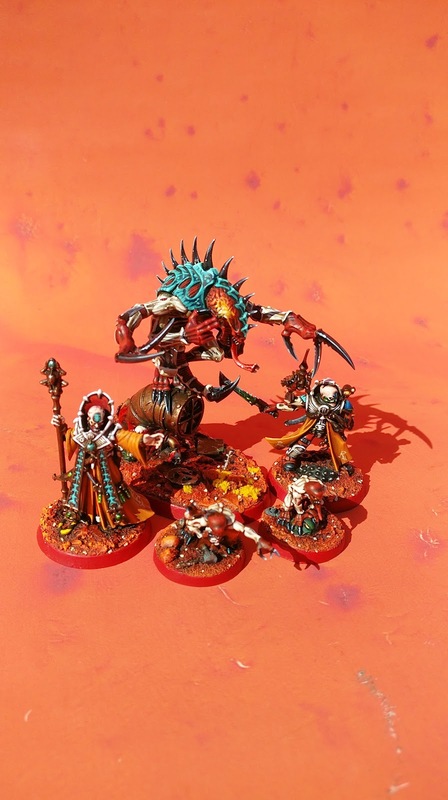 'nids part 212 - Genestealer cult - Brood Coven - MOAR SHOTS. 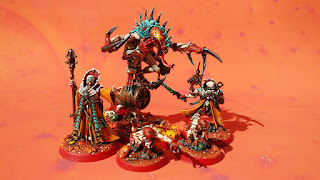 And tthe next plethora of shots of the Brood Coven, once again Camera 360 managing to capture quality that perhaps it shouldn't ought'a. They make a nice little family unit. 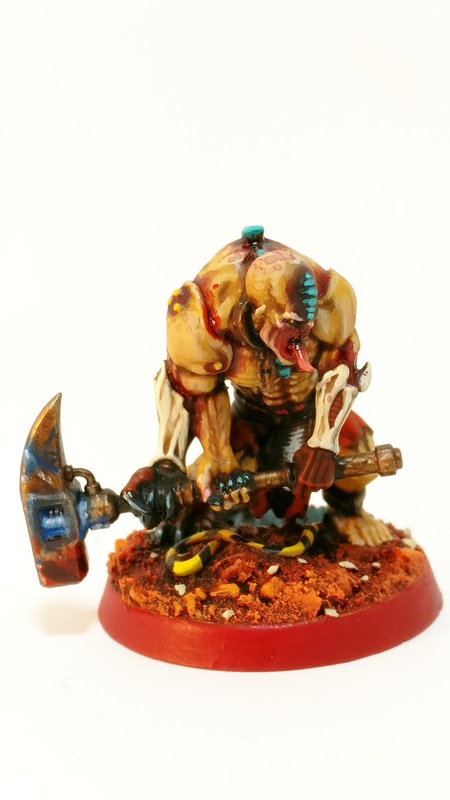 I'd also played around with my light box and a white background. As much as I am a fan of high-contrast saturated images there's something not-quite-right about this but it's not too bad. Although I was struggling to find the right white balance on the Patriarch. However, the Ferron background just worked. You'd think some much red/orange would have a detrimental impact on the colour shift of the image but I think this is pretty accurate. Slightly darker and desaturated here but I keep trying. The sad reality is that these pics are much more representative of the model and put it into context with the Red Planet BASE! on the red planet mat. 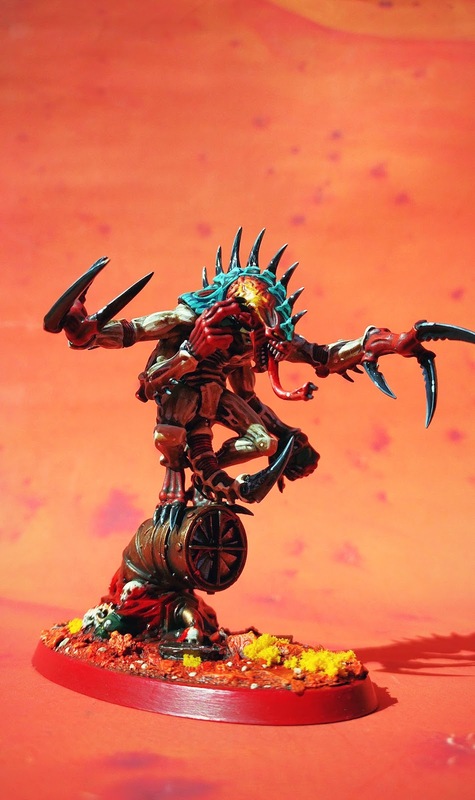 These are just the sort of pictures I'd be happy to share with White Dwarf and hopefully finally get into their hallowed pages but I have a sneaking suspicion that without a white background they wouldnlt be considered. It's much easier to cut them out froma plain background, although I'd happily do clipping paths for these if they wanted. Still, I'll send some of them in and give it a shot again. 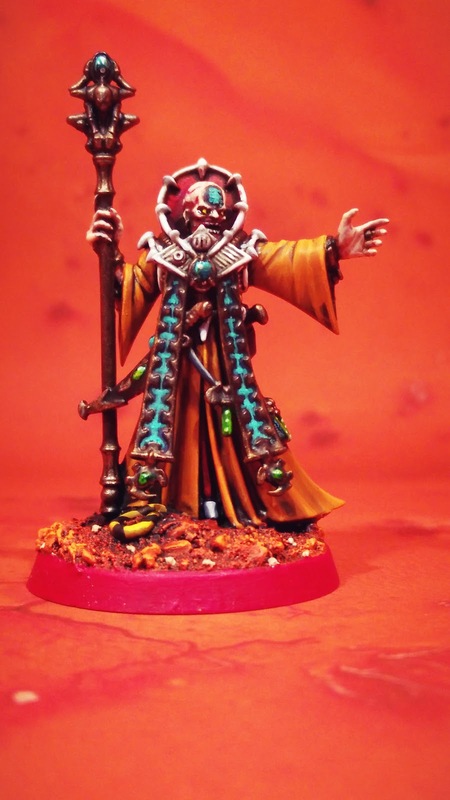 Such a great pose on this Magus. Some more experiments with the light box, less successful ones I might add. Looks like I was using my digital camera, hence the desaturated colours. This was why I felt compelled to wait until I had some more light as I know the digital camera can take nice pics it's just here they weren't. I've also picked up a new bulb for the light box since these were taken, a daylight 11W LED bulb that's 1500 Lumens. Hopefully that should help make better pictures. I probably need two of the them as the second bulb is still a 60W incandessant which has a warm yellow tinge to it. I did a bit of staged photography at uni, with three point lighting. 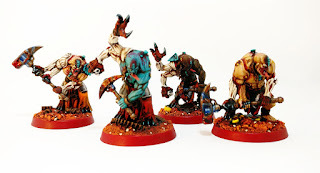 I think it's probably overkill on miniatures, certainly doesn't seem to need more than two according to GWs phtography guide. However the two light sources might benefit from being the same wattage and luminosity that way they cancel each other out and reduce the chances of casting shadows.